When winter comes, a girl and her dog explore a snowy world in this picture-book sequel. The girl and dog welcome the first signs of freezing weather as an opportunity to set out on their own. They navigate the snow-covered woods, wandering “where no one else goes” and finding stories in the imprints of wild animals (“Tracks left by cougars, / foxes, robins and pine martens”). With no adult in sight, winter presents an opportunity to have “a world all to themselves,” an urge any young child should understand. Because neither the girl nor dog is named, young readers can easily place themselves in the story and imagine that the escapades are theirs. The text conveys a deep affection for nature and the undisturbed wild: “There’s nothing like this world, / this playground called winter.” The duo’s exploits are entertaining and nonthreatening (“This is when the girl and her dog dance / When they leave everything in life up to chance”). After the weather gets too cold, they curl up together for warmth. Even as darkness falls, they decide to search for new marvels in a landscape transformed by moonlight. Stetsiv’s richly detailed illustrations emphasize the overall sense of playfulness and joyful discovery. The full-page drawings reflect the cool colors of winter: browns, blues, and white, brightened by the girl’s colorful snowsuit, hat, and scarf. Lighthearted pictures emphasize fun, showing the dog digging caves in the snow while the girl laughs or the canine happily licking the girl’s face. A nightscape washed in shades of blue reflects the peacefulness that follows a busy day. 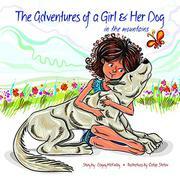 McKinley (The Adventures of a Girl & Her Dog: In the Mountains, 2015, etc.) tells the tale mostly in rhymes, some cutesy (“toeses” and “noses”), although others seem forced (“ice” and “life”), and occasionally the rhyme is lost altogether. Sometimes the text lacks clarity; what is meant, for example, by a world “where all traces of life vanish”? But these are minor inconsistencies in an overall appealing appreciation of winter. This warmhearted, endearing volume encourages children to enjoy nature and treat each day as an adventure.